As the proud owner of a northern Italian trading company, you must dispatch carts and wagons to find new customers for your goods. But times are hard and competition is fierce. Establish new markets by creating unique routes that bypass your competitors. Naturally, the larger towns are more lucrative, but profits will be greatest where you can keep the market to yourself. Competition will only hurt sales, so even a small village can be a valuable destination. A monopoly, however modest, is still sweet. Find the best way to reach your goals and bar your opponents from success by building a trade network across the variable board. Your opponents will quickly claim their routes, so plan your strategy with care! 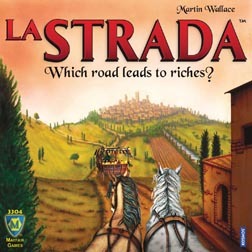 Creating the best network and taking the greatest share of the gold is the road to victory in La Strada! Designed by Martin Wallace. This is a really nice short/medium length game. It is a great filler game or nice to play on a weekday at the spur of the moment with family. It sounded a little "settlers"-y when reading the instructions, but there is not as much luck (roll of the die) involved. There are a few strategies that play out as the game goes along (such as defensive blocking or trying to cut off others to a portion of the board). However, you have to make sure if you are playing against more than 1 other person that trying this strategy can cause some backdoor traps on you! Overall, nice short game when you have a 1/2 hour to spare!